To the Moho and beyond ! 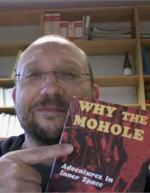 The IODP Expedition 335 (13 April to 3 June 2011), to deepen ODP Hole 1256D in the Eastern Pacific, coincided with the 50th anniversary of the first scientific ocean drilling expedition in April 1961, part of Project Mohole. Damon Teagle and Benoit Ildefonse publised this paper in Nature in March 2011 to celebrate this anniversary, and to present the future MoHole project. This paper generated a lot of interest in the media worldwide ; below are a some links to online press releases and articles.